Food obsessed sisters dish on what's cooking and what's growing. Take a virtual tour of Spannocchia's honey processing. 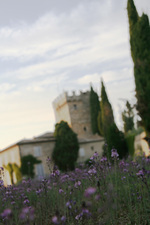 The farm is located on 1200 acres in Tuscany, Italy. Yesterday I fed 81 Cinta Sinese pigs from flour that I had milled the day before. Today I cleaned the salumi locker and collected eggs that hold the most brilliant yolks I’ve ever seen. And tomorrow morning I will bike out to a flock of Pomarancina sheep to see a newborn that was discovered just hours ago. This is the life I traveled to Italy for, and I’ve never consumed less nor enjoyed each day more. For the next three months I get to wake up as a Spannocchia intern – one of nine here to learn from and contribute to a “living museum of traditional rural life in Tuscany.” The 1200 acre property rises up out of the hills, as a wildlife refuge that has been farmed for more than 800 years. It is a unique place, certainly, where conservation of natural resources is the cornerstone. Not only are the organic gardens tiered with heirloom varieties, but the sustainable forestry program rotates through a 20-year harvesting program and the farm animals are rare heritage breeds. But what impresses me most is the community. Everyone, from year-round staff to B&B guests, interns and volunteers is entirely different. We’re all thinking in the same direction toward responsible living, but the backgrounds, ages, interests, fields, and perspectives spin the conversation and keep it interesting. We come together each night, after a day of work or play or painting or study, to gather at the same table under the stars and enjoy traditional Tuscan dinners. Eat any vitello tonnato yet? I love the PHOTOS! I had no idea you were such a pro! I love hearing about your experiences!! And yes, more photos would be wonderful!! Can't wait to hear about the porcini hunting. A very recent New Yorker had a piece on mushroom hunters/hunting in the forests of the Pacific Northwest. I have really been thinking about you Suzie and wondering what amazing things you are experiencing! I can't wait to read more! Suzie This will be such a wonderful imprint on your sensory memory. This experience is something most people only dream of. Pinch yourself and DRINK it in. I so enjoy your pictures and writing.